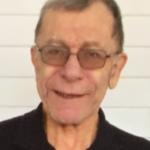 John Bernard Villano, 72, of Granville, died peacefully on July 25, 2018 in Rutland, Vermont. John was born in Granville, attended Granville High School, and went on to stay very active in the community for all of his years. An avid Yankees fan, he loved serving as an umpire for the Granville Little League. He was formally an active member of the Granville Band, and also assisted with the youth group at St. Mary’s Church. His favorite memory was vacationing in Maine with his special cousin Gale Bernard, who cared for him until the end of his life. John was a lover of music, developing a special fondness for country music, which was often playing in his room if you dropped by for a visit. When he wasn’t busy with his word searches or challenging friends to a game of Trivial Pursuit, he could be found socializing among the common areas of Holbrook Adult Home during his time there. No matter where you went with John, someone always knew him. He was a Granville native through and through. John always had a smile on his face and had an endless supply of jokes ready to brighten your mood at any time of day. Even in the hospital, he had a reputation for making the nurses laugh. He also had an eidetic memory, and often shared stories from his early years in incredible detail. John Bernard Villano is survived by his sister Anne (Mark Train) of Hartland, Wisconsin, in addition to loving nieces and cousins. John was preceded in death by his parents, Dominick and Mary (Bernard) Villano of Granville. A graveside service was held Saturday, July 28, 2018 at Our Lady of Mount Carmel Cemetary in Middle Granville. Online condolences may be made at robertmkingfuneralhome.com.